To add a visualization to a roadmap you start by creating a new view. Each roadmap view can have only one visualization: a Timeline OR a Swimlane. Whichever visualization type you choose, you will want to tailor your view to a specific audience by filtering the data on one or more fields. 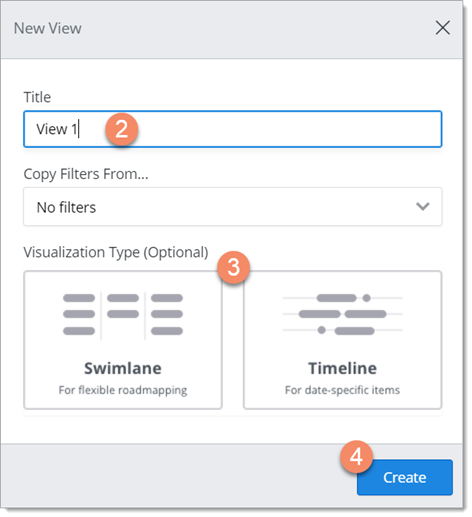 A view's filter set defines the subset of roadmap data that gets visualized. Filters are applied to both items and milestones. Any items or milestones that don't match the selected field values are excluded from the view. 1. On the Roadmap navbar, click the + View button. 2. In the New View dialog, enter a name for the new view (Title). 3. Select a Visualization Type for the view. You can skip this step and add the visualization later. Here's a snapshot of what the screen looks like after you create the view without selecting a visualization. To add a visualization, you'll use the Visualize button on the View navbar (see Add a Timeline to a view, Add a Swimlane to a view). At this point, the view has no filters and you can see all the roadmap items in the Items Table and all the milestones (if any) in the Milestones Table. Filters can be applies to a view from either the Items Table or from a visualization like a Timeline or Swimlane. In order to apply a filter, find the Filters icon located at the top right of the navigation bar. For detailed help on adding filters, go to Filter items in Creating and Working with Items and Milestones. Who can create new views? You can create a new roadmap view if you are the roadmap Owner or the roadmap has been shared with you as an Editor. If you share the roadmap as a Viewer, you can't add any views to it.